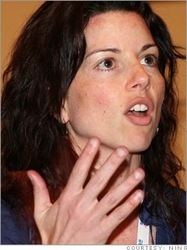 Ning CEO Gina Bianchini is being replaced as the CEO of Ning by COO Jason Rosenthal. Bianchini founded the DIY network of social networks with Marc Andreessen. But after five and half years at the helm, she is ready to try something new. She will transition to an entrepreneur in residence role at Andreessen Horowitz, the venture capital firm started by Andreessen. Over the past year, Ning’s unique worldwide visitors have doubled to 20.7 million, according to comScore, which is still much smaller than other social networks such as Hi5 (46.5 million) or LinkedIn (42.8 million). But at least it’s bigger than Friendster’s 15 million. Andreessen notes that Ning will continue on the same course under Rosenthal. Bianchini appeared earlier this week on Charlie Rose, and we caught up with here recently at Davos where Mike interviewed her on video.